Because we are all still currently human, one of the ways we can get back in touch with our intuitive side is by engaging in a process of regular meditation. When we meditate, we give ourselves a break. For even a few minutes, we let other people off the hook (a.k.a., forgiveness) as we put a pause on the mental chatter, the ongoing process of evaluating, judging, weighing and measuring our lives. I love the message in the song “Where Is The Love?” by the Black Eyed Peas. If we find that our hatred and judgment of what happens to be getting in the way, we can press the pause button and meditate. I love going to the Zen Center on Monday nights. When I meditate with a group of people, I find that I go deeper into my meditations. I wake up the next morning feeling happy and full of zip and drive. I laugh a lot and things that were getting to me feel like less of a problem. I don’t think that meditation alone will make you intuitive. However, by giving yourself a break from the sports announcer judging the play by play of your life, you allow yourself to experience the state of neutral from which true guidance may have the opportunity to slip in. Sometimes my meditations are just me sitting there listening to the endless “Ya-ya, nah yah,” before I eventually get bored with myself and find that I actually prefer peace instead. It’s like instead of trying to tame the horse I just let it ride itself out until it’s too tired to do much else. If you find yourself getting irate a lot, that is a good clue that you have too much hatred getting in the way of your true intuitive guidance. Photo: I always use my intuition when I create jewelry, scarves or shawls for other people. I imagine how the other person would like to look and feel, what colors would balance their energy and what sort of look would be best for them. Even textures come into play as I use my intuition to ascertain what kind of feel they would like best. 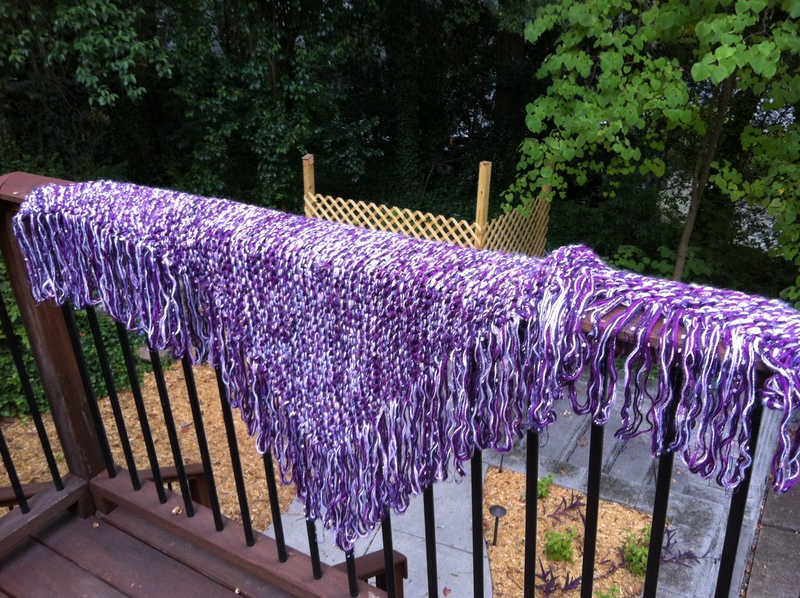 I made this shawl for Lillah Schwarz of Lighten Up Yoga in Asheville.